Right next door to Maine is the Durham Community Church of the United Church of Christ — a sprawling collection of connected structures located in Durham. The 1847 sanctuary is connected to offices and a large function hall built in 1999. This structure is connected to a 1960’s vintage brick building which houses classrooms, a chapel and thrift shop. Why all the interconnections? In New England, where folks preferred not to go outside unless absolutely necessary during the cold winter months, the buildings were often connected. 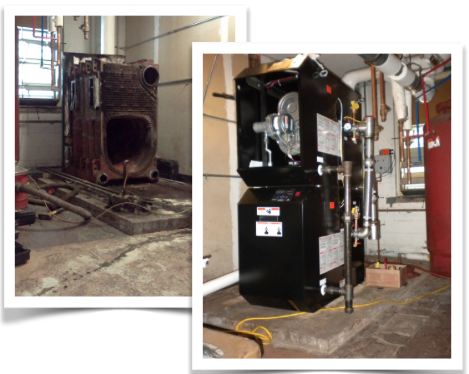 In this case, more than two centuries of connected buildings were heated by an oil fired boiler system with an aging, failing and inefficient boiler. The church was using 7,000-9,000 gallons of oil per year on heating. After debate and discussion the church voted to support the removal of the oil storage tank and oil-fired boiler and replace the system with two high efficiency gas fired boilers (87% efficient). The completed project saves around $16,000 in annual energy costs, and reduces global warming emissions by 18 tons every year. The congregation has had a long history of concern for the environment, including climate change and how its energy use impacts the future health of the planet. Motivated by this and a 66% reduction in annual energy costs was a terrific incentive. By installing the necessary piping to allow for future expansion to utilize solar as an alternative, the church continues to commit itself to further energy savings and reducing its carbon footprint.